The eleventh (11 !!!) episode of Margarita King’s journey is now out. 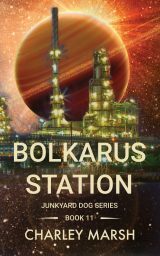 Bolkarus Station: the Junkyard Dog’s last chance to make the dangerous rendezvous with Slade and hand over the precious and highly illegal Rose Sunstones. Bolkarus Station: an ugly refinery and refueling planet, a place no one in their right mind wants to visit. Perfect for a secret rendezvous. Margarita King plans to land, meet Slade, and leave as quickly as possible. Simple. Straight forward. Stay on task and get out of there. Unfortunately the best laid plans rarely work out as intended. Join the Junkyard Dog’s crew on another adventure as they dig into the hidden world of a galactic refinery and the secrets it holds.